Another month, another dive into Nerd Block Classic. You know, I’m running out of ways to do introductions for these articles. Oh, well. On with the review. First item in the box is a 2017 calendar. 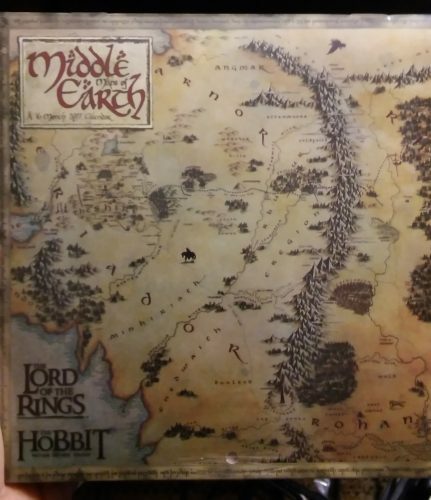 A Lord of the Rings/The Hobbit calendar. 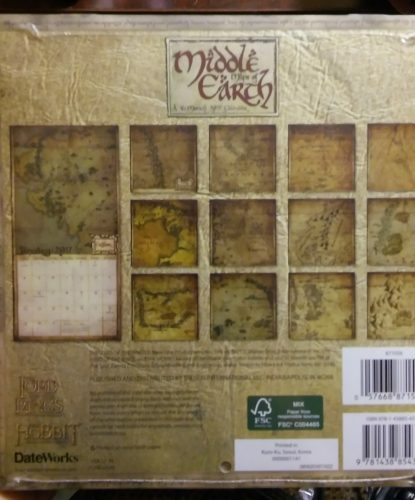 The calendar features maps of different areas of Middle Earth, a new one for each page. As I’ve expressed in the past, I HATE this franchise, so I’m not exactly thrilled. Having said that, this saves us from buying a new calendar this year, so…win? I guess? Moving onto item number 2, which comes from A Nightmare Before Christmas. A pair of sweater socks, which my wife claimed immediately. That’s fine, as I figured she would anyway. These are a lot thicker than the socks we’ve received from Loot Crate in the past, and also appear to be more stretchy, which is a good thing. Plus, with winter finally hitting here after one of the warmest autumns on record, she’ll get plenty of use out of them. And who doesn’t love Nightmare? Time for the monthly button/lapel pin. It’s one of the no-lace Nikes from Back to the Future, Part II, which became a real thing recently. Not bad, but it’s made of PVC instead of metal. 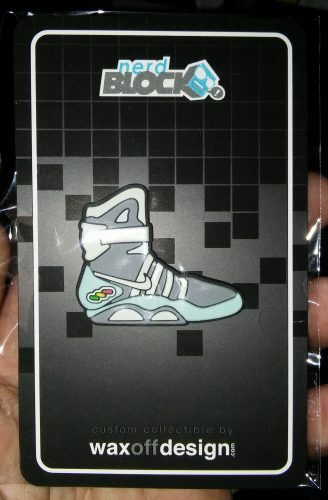 I’m not a big fan of the PVC ones, so this may just have to go on display instead of getting worn (not that this is an uncommon thing with our button/pin collection). Three more items left. The first of the three is one from everyone’s favourite “Merc With a Mouth”, Deadpool. Look, Deadpool is cool. Bowties are cool. 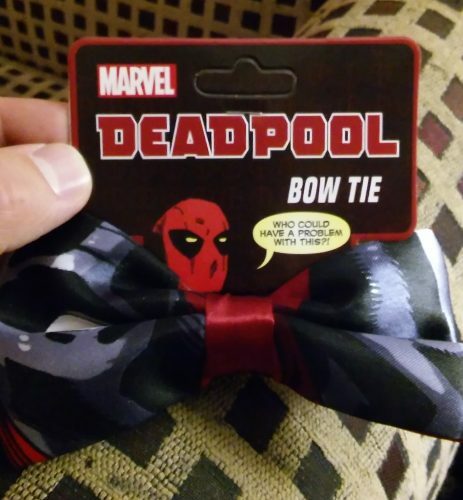 a Deadpool bowtie? Sorry, no. To respond to your question, Wade, *I* could have a problem with this. This is the second bowtie I’ve received in one of these crates (the first was one in a Loot Crate box ages ago), and much like that one, this one will go into a box and never get any use. I already don’t ever have any moments where I can or need to wear a bowtie, but if I did, I wouldn’t go with a Deadpool clip-on. I just don’t understand what demographic they were aiming for with this? Alright, two more. 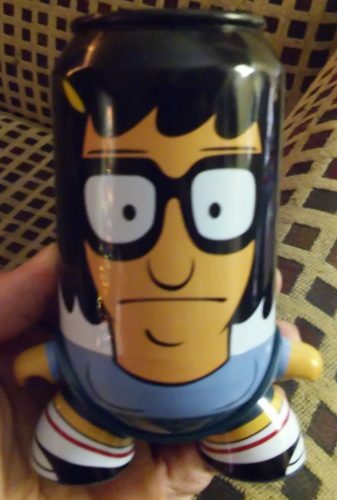 This next one is from Bob’s Burgers, and it just confuses the hell out of me. 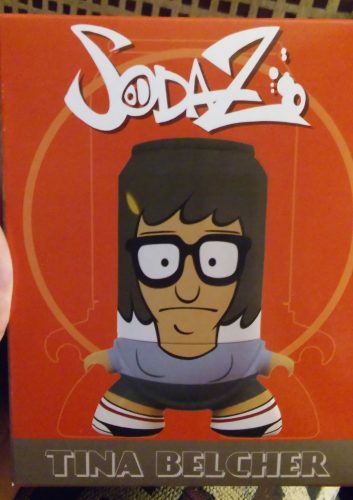 It’s a Sodaz vinyl figure of Tina Belcher. I have never heard of this particular line of collectibles, and looking at the item itself, there’s a good reason for that. 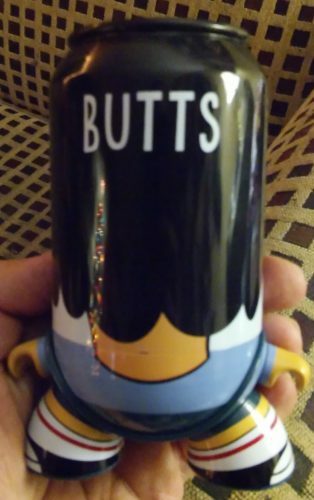 The name is at least accurate, as the figure is shaped like a soda can. Why? I have no clue. Who thought this was a good shape for a collectible figure? Turn her around, and the word “BUTTS” is written on the back of her head. Again, why? I am very familiar with the show (and actually like it) and understand Tina is obsessed with butts, but not once have I ever seen an episode where she had it written in her hair. Maybe I missed that episode, but I seriously doubt it. Yep. 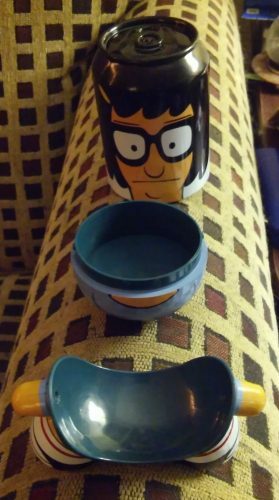 You can separate it into three pieces. FOR ABSOLUTELY NO DISCERNIBLE REASON. WHY? WHAT IS THE POINT OF THIS? WHAT PURPOSE COULD THAT POSSIBLY SERVE? Gah! I just don’t understand. Okay, onto the final item, which is the monthly t-shirt. 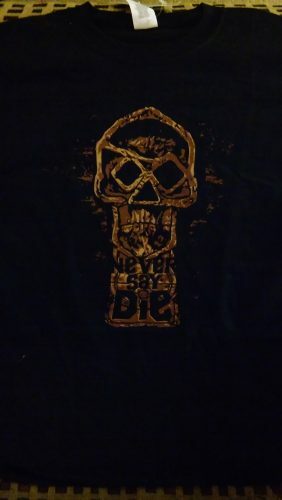 It’s a shirt based on The Goonies, featuring One-Eyed Willy’s key with the famous words “Never Say Die” written on the bottom. I really like this, as I’m a big fan of the movie and have been since I was a kid, but I’m also a bit disappointed. By sheer coincidence, I got a One-Eyed Willy design for a mystery shirt from my last Shirt Punch order. It’s fortunately a completely different design, but still. I do like variety. Overall, this month was pretty disappointing. I wasn’t super crazy about any single item in the box, which is a first for me and this particular subscription service. Not only that, but it seems like there were significantly fewer items this time around. On a whole, it doesn’t feel like a lot of thought was put into this one. Fortunately, things are looking up for next month. Only one franchise has been mentioned, but it’s a good one: in the next box, four of the items will be from Rogue One: A Star Wars Story, which I am absolutely ecstatic about. My excitement for that particular movie cannot be understated as a lifelong Star Wars fan, and I’m always up for new collectibles from the series. I just hope Nerd Block chooses the items wisely and doesn’t disappoint.